​​SUZANNE NILES is the public relations and media representative for The Salvation Army Vision Network. Suzanne has worked in different facets of the entertainment business for several decades, including acting, producing, and arranging promotions through all types of media outlets. She has a passion for Jesus, networking and connecting people to the proper cause. Suzanne makes her home in Spokane, Washington. ​​​WENDY SIMPSON LITTLE is the owner and broker of a small real estate company in Central California. In her previous careers, she has been a stay at home mom, and taught 7th grade English and high school French. She has a passion for her friends and family, fun and life! She hopes to encourage other women in faith, prayer, and a love for God and his Word. Wendy makes her home in Visalia, California. ​Face it ladies, we need each other. We all desire relationships that are intimate. A friend we can trust and confide in. Someone who will hold the concerns of our heart with a tender commitment to support and see us find the answers to those concerns.Women have a unique, God-given capacity to connect and to love. But are we exercising that gift? As Christ followers, are we growing? Are we seeing answers to our prayers? Do we approach the throne of God alone with the requests that turn our lives inside out? Or are we being the body of Christ, sacrificing for and supporting each other? If you can’t say yes to these questions, a “Fast Friend” could be the answer. 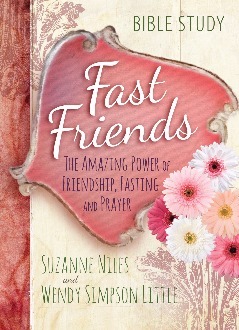 Fast Friends looks into the lives and experience of two women God brought together to walk through life as friends and prayer partners. It chronicles their failures and successes, their shared and varied experiences, and the faithfulness of God when they chose to move towards Him. Find your Fast Friend and learn how you can partner in prayer and fasting to experience life-changing spiritual growth, amazing answers to prayer, and intimacy with one another that bears eternal fruit. The Fast Friends Bible Study is 12-week study for individuals or groups to learn more about those in the Bible who sacrificed and benefited greatly from fasting andprayer, including Moses, David, Ezra, Nehemiah, Esther, Daniel, Jesus, the early church, and more. You too can partner in prayer and fasting to experience life-changing spiritual growth, amazing answers to prayer, and friendship with one another that bears eternal fruit.